Timpani covers mediocre singing (I know because I’ve sung mediocre-ly and been oh so thankful for the timpani). Timpani adds spice, interest, excitement. 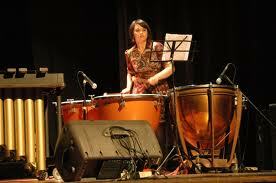 Timpani must give the player great satisfaction. Imagine just wailing on those big drums. Timpani is the most wonderful instrument. You can release all your frustrations and thrill people at the same time. Throwing a hissy fit doesn’t really net the same results. Now, I am no instrumentalist. I am a mediocre singer, but the more I think about it, the more I think I may have missed out in life a bit. But then, haven’t we all. Not many of us play timpani. Not many of us write or sing or paint or train dogs or jump horses. We mother, we cook, we clean, we work. But somewhere within us all, we dream of something bigger. The funny thing is that I am off — in 10 minutes Southern Man tells me (Daddy Bill would have said 6 minutes and 37 seconds, wouldn’t he, cuz?). I’m off to hear Joe Bonamassa at the Concert Hall. I listened to the classical music (which I never do) because I’m going downtown where Mema and Daddy Bill went religiously to hear the symphony. I enjoyed it. Tonight I will enjoy the blues. I wonder if they will have a timpani.